We’ve been home for a week but I’m still dreaming about Marilyn’s Charleston Gumbo. Most of the meal recipes we share here include some element of canning and preservation. For example, we may suggest adding salsa to spice up an omellette or orange marmalade cake with a chocolate glaze but rarely do we just share a meal recipe. However, an exception is in order with this one because Marilyn’s gumbo is out of this world! Marilyn, has been a family friend for over 20 years. And, she is the cook responsible for introducing me to one of my favorite southern dishes, gumbo. Every time we plan a visit to see family and friends in Florida, my mom makes sure to notify Marilyn and to take her a hambone with the soul purpose of being part of her gumbo creation. The rest of the magic occurs in Marilyn’s kitchen where she confesses “the recipe changes every single time depending on my mood and the ingredients on hand.” Inspite of her ever changing recipe, the constant is the down home southern goodness that makes your heart and mouth sing with every mouthful. Marilyn’s gumbo is the best and even now sitting here writting this I’m wishing there was a pot of it heating on the stove. 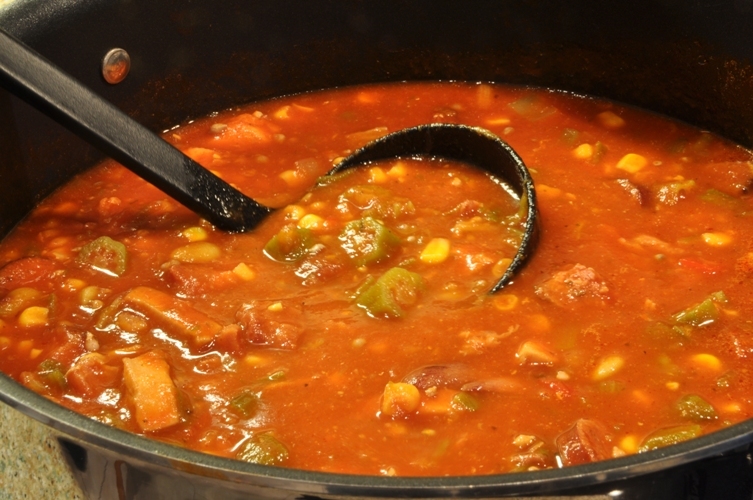 As we sat down to enjoy a steaming bowl of gumbo over rice, Marilyn chuckled as she remembered that this meal was a childhood favorite, a staple part of every Sunday dinner. Marilyn recalled, when she was ten “Everyone made gumbo. Aunt Mamie, Aunt Essie, Aunt Maggie, everyone! But your recipe is your own and devaition is allowed!” It’s amazing how sharing a meal can create such powerful experiences and memories that last a lifetime. The four of us laughed and ate and ate some more. It was a wonderful night with a dear family friend. Cook hambone or hamhock in boiling water until tender. Slice sausage, cube chicken, peel shrimp, and cut meat off hambone. Add any combination to a pan and suatee until browned. Meanwhile, wash and chop okra, green pepper, onion, and celery. Sautee green pepper, onion and celery until soft. In a large stainless steel saucepan combine cooked meat (including hambone), sauteed vegetables and all other ingredients. Reserve shrimp, adding after the gumbo has cooked for at least 1 hour. Cook, stirring occasionally until the flavours have combined and the gumbo is thick. Approximately 1 1/2 to 2 hours. Additional tomato sauce is added to thicken the gumbo if needed. As you can see this is a loose recipe and many of the quantities are left up to the chefs discreation but it’s a great start. 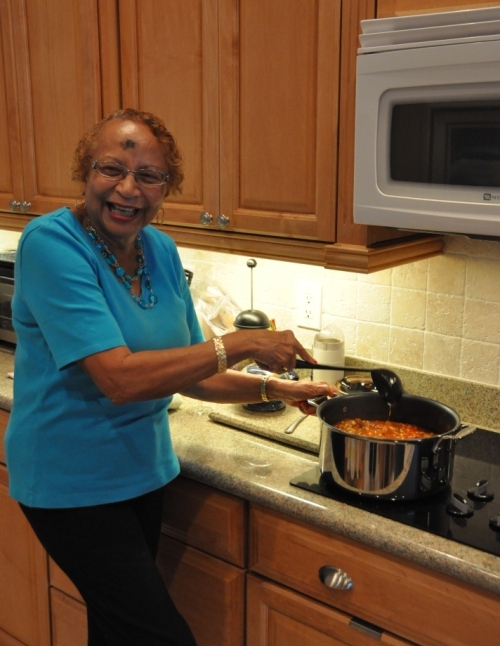 Marilyn has been making this gumbo since she was a little girl and it changes every time. She encouraged us to make it our own and add whatever we had on hand at the time. Afterall, that’s what she does! You are familiar with Little Feat and “Mighty Rad Gumbo? Never can eat it without breaking into a chorus or two! Next time I can get my hands on some fresh okra here, I can send you a can of pickled okra and you can try your hand at you own gumbo. That way you can say you actually used a canned item to make it! That’s awesome! I would love to make gumbo using your pickled okra…maybe we could trade? Definately!! I’ll contact you as soon as I get a fresh crop of okra. You’ll just have to let me know if you like it with a kick, or just plain jane! Cool…you’ll have to let us know what you’d like. I can’t take much heat but Matt loves it…so, maybe somewhere in between!? Do you grow it? I’ve read that it will grow in Northern gardens that can grow tomatoes and peppers. I might think about trying to grow some…I do love it! I can’t grow anything! However, I have a friend with a Dad on a farm in the middle of Florida, so she grabs a few bushels for me when she goes out to visit him. My co-worker has a Mom that is up in Georgia right now and I was told she would be bringing me some, so I’ll probably have something canned by the end of April. Since I can’t grow anything I do try and stick to local growers. The people I know that grow it are also growing copious amounts of peppers and tomatoes! I’ll have to include a jar of my famous Sweet Heat Pickles as well. Those only have as much heat as you can handle. I’ll shoot you an email when I get my hands on some okra! OK, this post has been in my head all week! Just got back from the grocery store and I’m proud to say, I bought hamhocks for the first time EVER! They’re happily simmering away and I can’t wait to start chopping and preparing the rest of the ingredients. I bought chorizo for sausage – I couldn’t decipher if a dry or wet style sausage was required, so I went dry. I’ll let you know how it goes! I wish we lived closer because I’d be knocking on your door with a spoon out!